Most of the sheep's milk cheeses you'll find in retail shops are firm, aged wheels in the style of Manchego or Pecorino Toscano. Fresh, young sheep's cheeses are much rarer. 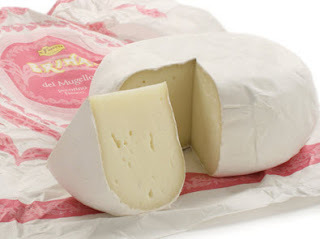 Brinata is a delicious Brie / Camembert like cheese from Tuscany and is made from sheep milk. It has a velvety rind, like it is dusted with white powder. The Italian word brina means frost, and that's exactly what it looks like. The cheese has a pale white interior, that is moist, milky and floppy with some small eyes. The paste is off-white with a fresh, delicate, cultured-milk aroma. You can't expect a lot of flavor development in a cheese that is probably only 30 days old, but you'll be surprised at how much character Brinata has. The salt level and acidity are just right. The rind is not remotely harsh or ammoniated, as Camembert rind can be. Il Forteto cooperative makes a wide line of sheep's and cow's milk cheeses but what you may not know is the compelling back story of the business. It was established by a group of disaffected young Italians in 1977, some only 19 or 20 years old at the time, with the assistance of a philanthropist from Milan. The idealistic young people settled on agriculture as the basis for their cooperative, although they knew nothing about farming, and they proceeded to build a communal lifestyle, starting with 40 sheep, three cows and three pigs. Over the years, the cooperative members have welcomed many abused, orphaned, homeless or psychologically troubled young people and put them to work on the farm, in the dairy, or in the retail market they now operate on the premises. They are paid for their work and educated, fed and sheltered at no charge. Every day, the cooperative members and young workers -- about 120 people in all -- gather in a giant dining room for a full-scale Italian lunch. 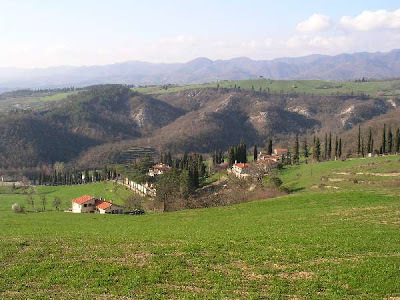 The cooperative still has almost all of its original members, and today are one of Italy's biggest producers of Pecorino Toscano.